Instinctoy has just opened it's February Lottery featuring 6 production releases and three one-off customs. This is the first and likely only opportunity for collectors to purchase these toys at retail, many of which were originally released back in December at Tokyo Comic Con. 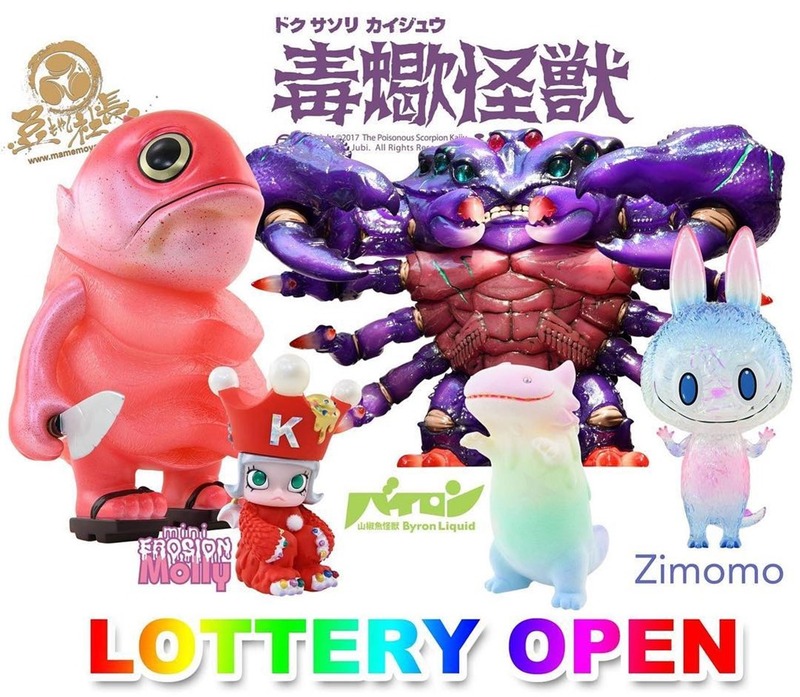 The following toys are available via the lottery which ends on February 13th at 6:59 AM PST : Giant Maguro Senpai Red Snapper by Mame Moyashi (~10", ¥16500/~$150), Mini Erosion Molly Christmas Edition by Kenny Wong (~3.8", ¥5000/~$46), Byron Pastel Rainbow GID Flocked (~4", ¥10,800/~$99) by Shoko Nakazawa, Kasing Zimomo 'Ka' Instinctoy Exclusive (~7.5", ¥12,800/~$117) by Kasing Lung, The Poisonous Scoprion Kaiju in both the Antares (~7.4", ¥32,400/~$2960 and Green Blank (~7.4", ¥17,800/~$163) editions by Jubi Yang. Instinctoy is also offering three Blow Away customs by Josh Mayhem: Vincent (¥200,000/~$1825), Halloween Inc (¥100,000 /~$912), and Crystal Storm (¥100,000/~$912). Instinctoy is running the lottery through their online stores: Instinctoy.net (Outside of Japan) and Instinctoy.com. To enter add each time that you'd like to purchase to your cart. No payment will be required at checkout, and will only be required if you are selected as a winner. The lottery closes on February 13th at 6:59 AM PST. For a full description and additional pictures of each item head on over to Instinctoy's detailed lottery info. 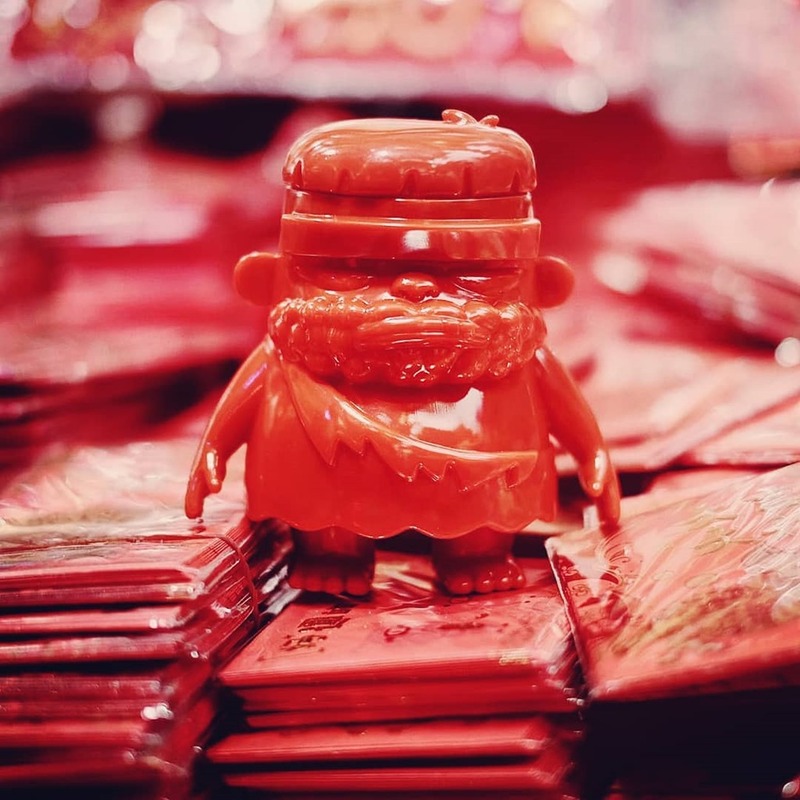 To celebrate the Chinese New Year, Kong Andri will release his Sibatu unpainted red edition. The prehistoric hunter soft vinyl offers a distinct vibe without a hint of trend-following. Limited to 12 pieces, this fierce Sibatu will be available on Monday (2.4) at 5 AM PST from his web shop. 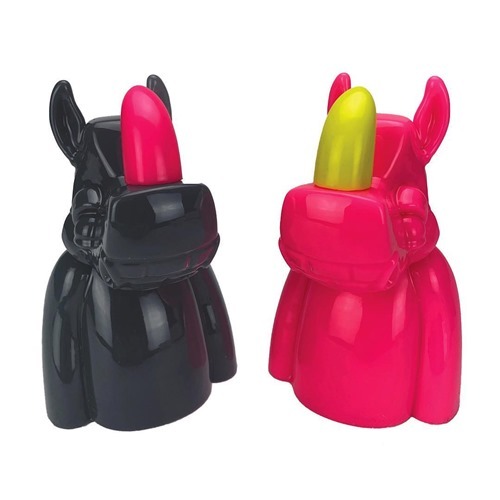 With a tongue-in-cheek, reverse twist, Scribe and Silent Stage will release two Valentine's Day Exclusives of the new 'Not An Aphrodisiac' resin bust. Following the debut Black + Gold DCon Edition, these new Black + Neon Pink and Neon Pink + Yellow Valentines editions celebrate Rumpus, Rhino preservation, and art as the sweetest of treats. Limited to 25 pieces each, the 'Not An Aphrodisiac' Valentines Editions will be released on Monday, February 11th 2019 at 10 AM PST from Silent Stage's web shop for $150 each. Back in December, 3A released the Transformers DLX BumbleBee figure in conjunction with Hasbro. Now, their new DLX Blitzwing figures continues the DLX format recreations of the pivotal BumbleBee film. At 10.6" tall, the smaller format DLX Blitzing offers a highly-detailed rendition of the high-flying Decepticon with 51 points of articulation, spot use of die-cast metal parts, and LED light-up eyes. As with BumbleBee, Blitzwing comes with an ample arsenal including interchangeable left and right arms (standard and weapons), three sets of hands (fists/relaxed/action) and a stylized display base. 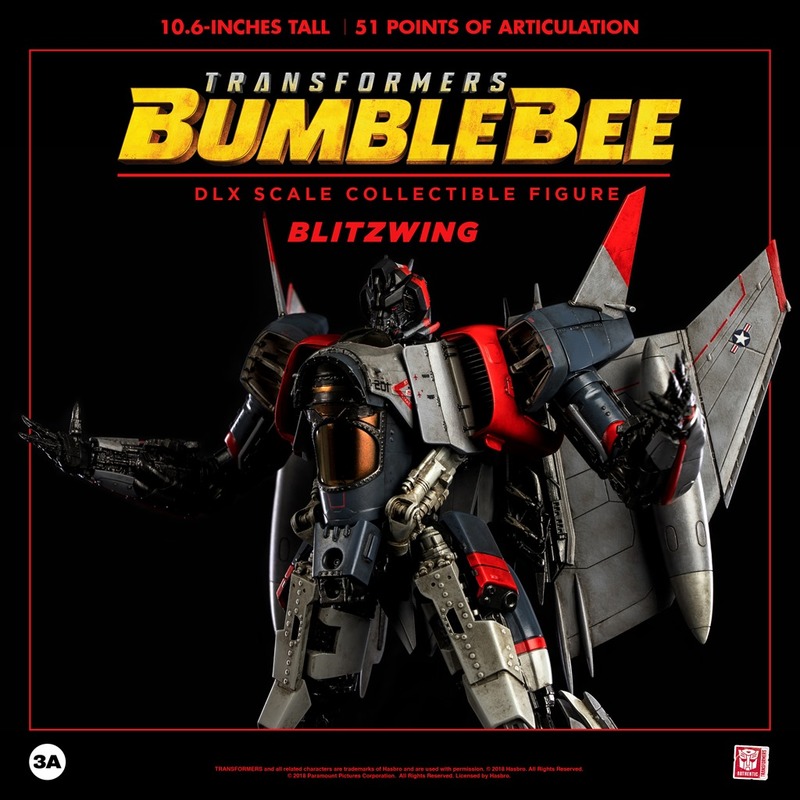 The DLX Blitzwing is available for pre-order now for $199.99 direct from 3A with free world-wide shipping. 3A expects to ship their newest DLX Transformer in Q3 2019. With the Year of the Pig lunar year coming in just a few days, we've seen quite a few Pig-themed art toys, both original designs and special editions of existing toys. 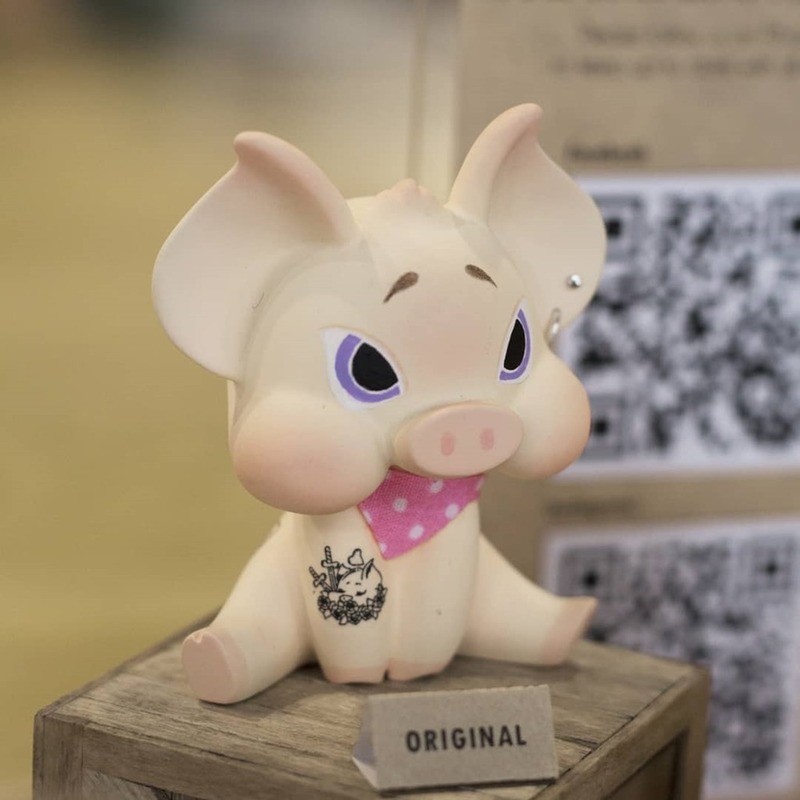 The brand-new Pigtist from Thailand-based Pigtist Toy caught our eye with plenty of personality to spare. The sculpt is nicely done with cute proportions from the large, wide face, to the stylized, sitting body. Embracing its inspiration, Pigtist delivers the goods with a wide nose, hoofed feat, and a tail. Not content to rely on the cute appeal, the artist has added a bit of edge with the earring, and the tattoo-inspired graphics. Pigtist (2.5", 10 pcs, resin) is currently available for $32 as a pre-order. To place an order, head over to the pre-order page on Facebook and leave a comment with a '1' indicating that you'd like to order one toy. The artist will confirm successful orders and arrange for payment. Orders will ship in roughly two months. Steven Choi is working with Japan's Kaiyodo to bring his Zu & Pi Universe to life as a new mini series. The new series will be shown at the upcoming WonderFestival Winter (2.10) in Japan. 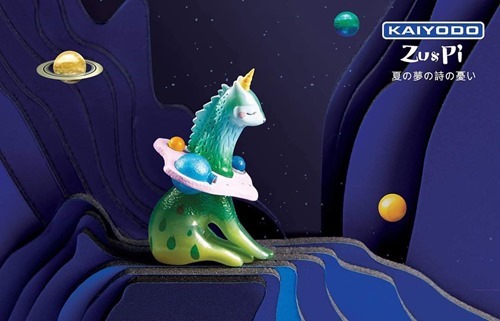 This first sneak peek of what appears to be a celestial creature is quite promising with an excellent paint design. The new minis should be a nice compliment to the artist's larger Pi vinyl figures. David 'DSKI ONE' Osowski debuted his dark shape-shifter, Aleister Growley, in a hand-painted pink resin edition last May for Five Points Festival. 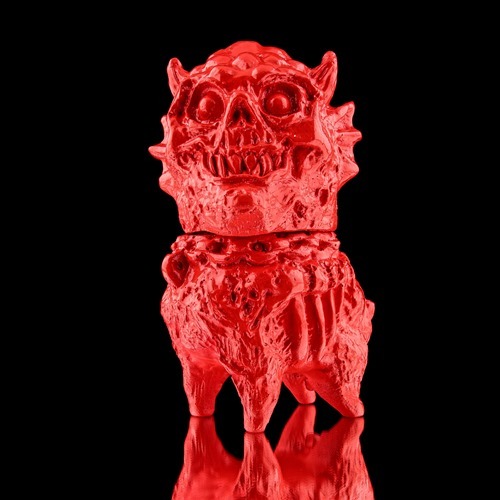 The demonic dog, part of the artist's Infected by Devils series, has crossed over into sofubi. First out of the the depths, is an unpainted Aleister Growley proto edition cast in deep red sofubi. It's available for $25 each as a timed pre-order from Lulubell through February 14th at 5 PM PST. These are currently set to ship in late March.